For those who cannot start the daily grind before enjoying a piping hot cup of coffee, the right brewer is on top of the list. 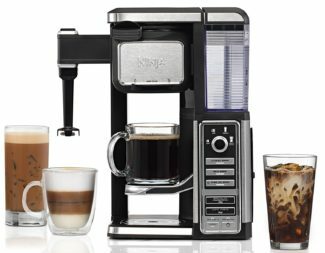 You can spend over 200 bucks a brewer with an interactive display and other pro-style features. But did you know that you can get a reliable brewer to give you a consistent cup of coffee with less than $150? Of course, when buying you need to consider your personal preferences. With a little understanding on the on the features of a good coffee maker, it will be easy to select a coffee maker that best meets your needs. We read the other people’s opinions, reviews and ratings. Only if our opinion is similar with the majority opinion we add that coffee maker in our list. The list below includes best coffee makers under $150, each of them offers you a different level of efficiency. We will look at their different comparable features, to give you an insight on decided which one suits you best. Since they all fall under the same price range, the choice is entirely yours depending on personal preferences. 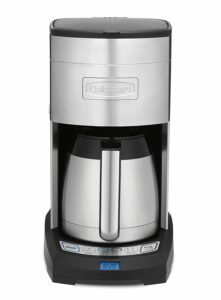 The Cuisinart DCC-3750 Elite 10-cup coffeemaker is a good choice if your budget is under 150 dollars. It is fully automatic with easy touch pad controls that make your brewing easy. It has an adjustable coffee brewing temperature control with three internal temperature heating setting of regular, hot, and x-hot. This feature allows you select the level of hotness for your cup of coffee. The DCC-3750 coffee maker is also programmable hence making your brewing experience easy and fast. If you like your coffee brewed fast without losing its flavor or quality, then this is the coffeemaker to go for; it has an extreme brew fast engineered brewing technology which enables it to brew 25% faster than a regular coffee maker. With a gold tone filter and charcoal water filter, this coffee maker gives you the freedom to enjoy your coffee either regular of bold. With the Ninja coffee bar single-serve system, you can unlock the full potential of your ground coffee as it has an advanced thermal flavor extraction technology. With this feature, you get to enjoy full richness of your coffee. With the classic brew, you get a smooth and balanced flavor of your coffee while with rich brew you enjoy the intense flavor that stands out to milk, flavorings, and crème. You can also use Over Iced Brew with this coffee maker to get perfect iced coffee free of the taste watering down. The Bunn-O-Matic 10C BLK Coffee Maker comes with an elegant and contemporary design, and it is also highly durable making it give you a long service. It has the capability of brewing 10 cups within 3 minutes without losing the taste and flavor of your coffee. With an internal thermostat, you are assured that the water reservoir will keep the water at an ideal temperature to allow the coffee maker brew on request. 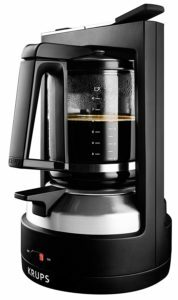 The 10C BLK coffee maker also comes with a warming plate with an On/Off switch to prevent your coffee from getting cold. The vacation switch integrated into this coffee maker allows it switch on idle mode when not in use, hence helping save power and also minimizes burning incidences in case you forget to switch it off after use. The coffee maker’s tank is stainless steel, and so is the face plates which make them easy to maintain clean. 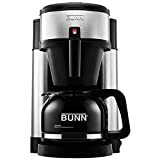 This Bunn-O-Matic coffee maker is made of quality material and is easy to maintain since it comes with an easy to read the user manual and is dishwasher safe. It is also easy to use, and you can count on it to produce a quality cup of coffee with every brew. Krups Moka Brewer 4689 features a glass carafe that rests on a hot plate and acts as the lid of the water tank. The water reservoir is fitted with coils for heating the water. Once the water is heated, it rises on one side of the machine up to directly above the carafe. Through steam extraction, the machine produces full-bodied coffee which is rich in flavor. Krups is German coffee maker brand and that and it guarantees high quality and durability. Additionally, this coffee maker comes with a permanent wire basket, meaning that if you like using paper filters, you will be double filtering your coffee. To prevent the brewer from opening during operation, Krups Moka Brewer has a lid on top. If you are looking for simplicity in brewing while still producing a quality beverage, the KRUPS KM4689 will be your perfect choice coffee maker especially for a budget under $ 150. If you consider durability and reliability, KRUPS KM4689 coffee maker is one of the best-designed coffee makers by Krups. In case you switch it on by mistake, let’s say when cleaning, and yes it will get hot but not a single sign of breaking down. It also comes with a readable manual which you need to follow to the letter when assembling the machine. Before putting it into operation, you should consider cleaning it first. 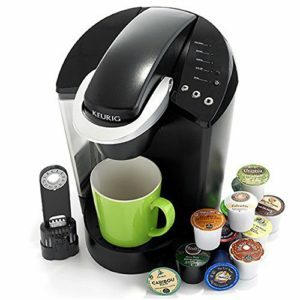 This coffee maker by Keurig produces a fresh cup of coffee with every brew. 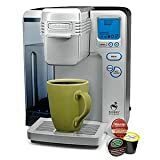 To allow the coffee maker always be ready to brew when you want coffee, Keurig applied microprocessor controlled technology which maintains the water at the appropriate brewing temperatures. The coffee maker also produces consistency in every single cup with its new needle flavor extraction technology. The Keurig k55/k45 is one of the safest coffee makers to use as it has an auto shut button which automatically goes off if the coffee maker stays in a standby mode for long. 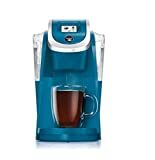 You can choose any of this models of Keurig K45, K50 or K55 because differences between them are very small. The Keurig Elite single-serve to accommodate three cup sizes depending on your preference. This feature also makes it easy to maintain the coffee maker clean without the brewing getting messy. This coffee maker is suitable for brewing tea, iced beverages, and hot chocolate in less than a minute and just a by a button click. Additionally, the coffee maker comes with a bonus of 12 Keurig sampler. It is dishwasher safe, and with a removable drip tray, you can easily clean it and also use a travel mug. It has light indicators to show you the brewing progress and also has high consistency when it comes to producing brewing water. We added a few more coffee makers because it all depends what you want from your coffee maker. If you have suggestion for some other coffee maker you can send us comment. If you are tight with budget then you can check under 100 or under 50 coffee makers. Of course better quality generally means a higher price. When purchasing your best coffee maker under $ 150, it is important you look at other features and especially reliability and durability in addition to your personal preference. In most cases, a good coffee maker should give you at least five years of services. Sometimes the price tag doesn’t necessarily dictate the quality of the product. 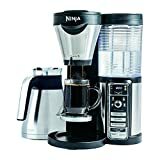 It is possible to get a well-made coffee maker at less than $150 which will serve you for the same period as a more sophisticated coffee machine. Next story Delonghi Dedica vs Gaggia Classic Comparison – Which Espresso Machine Is Better?